When we arrived in Tahoe on February 12th, there had been little snowfall for the winter so far. 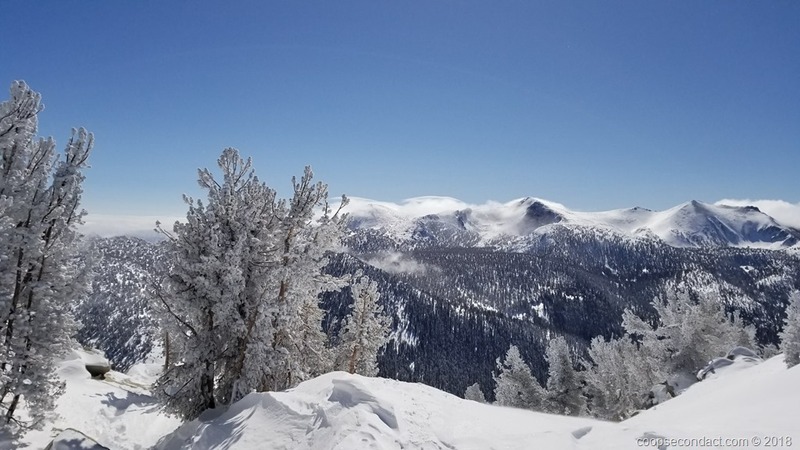 Fortunately, Heavenly mountain has good snowmaking capabilities so there were several runs with good coverage so that we found pretty good ski conditions. Of course, if you looked off into the trees you would see mostly rocks and stumps. So definitely, stick to the main runs. By the time we left 3 weeks later the mountains had experienced 3 to 5 feet of new snow. The bulk of it came just before we left but there had been new snow over the course of the 3 weeks. Something to keep in mind for our next ski trip: The week that includes President’s Day, in this case the week of Feb 19, is “Ski Week” which means the schools in the San Francisco Bay area are closed so families can have time to ski. This means that the ski lifts were relatively busy all that week. Our friends Steve & Wende generously allowed us to stay in their home in Zephyr Cove, NV, and Steve came up to join us for our last week. He had also received some single day lift tickets for Squaw Valley so we enjoyed a day of skiing there which is on the northwest side of the lake. Perhaps you’re aware that Squaw Valley hosted events of the 1960 Winter Olympics. Remarkably, it had only been in existence for 11 years at the time.